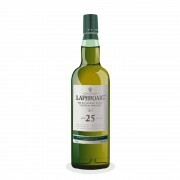 This is the first 25-year old Laphroaig, released in 2007. It was matured in both ex-bourbon barrels and second-fill ex-Oloroso sherry puncheons that were handpicked by master blender Robert Hicks. The first thing I get on the nose is smoke - no surprise there - but rather subdued, followed by a good dose of vanilla and a hint of lemons. Then there are flavours of sherry and dark fruits such as prunes, figs and dates. Next, notes of cardboard and furniture polish develop. Overall, this is a well balanced and very enticing nose. The palate is light-bodied, oily and lightly spicy. Vanilla flavours again come first, followed by caramel and wood spice. The peat is there, very well integrated and getting counterbalanced with sherry sweetness. The finish is long and smoky. Seaweed is now the dominant flavour, together with cardboard. This 25-year old is a very nice Laphroaig, for sure. I loved the nose that is really well balanced and nicely complex. The palate however would benefit a lot from a higher ABV - why this was bottled at only 40% beats me. Overall verdict: lovely nose and very well balanced but without much impact, especially on the palate. Wow only 40? That surprises me. I guess they needed to stretch the supply. @Pierre_W Any 25 yo should be a statement by the distillery. Having Laphroaig releasing a 25 yo at 40% abv without much impact on the palate is simply a shame. It is even more surprising coming from a distillery that has many core expressions offering big strong flavors. 40%!? Wow! Frankly, I'd be put off buying something so old (and no doubt expensive) with such presentation. That being said, some 40% whiskys work fine - Laphroaig 10 being one of them; but I'd like to see 43% as a minimum. @RianC, I imagine that you have read on this site that all of the standard Laphroaig 10 sold in North America, i.e. Canada and the USA, is at the 43% ABV strength. Another point with 25 yo Laphroaig being bottled at 40%: this might not be so very far from the Cask Strength. 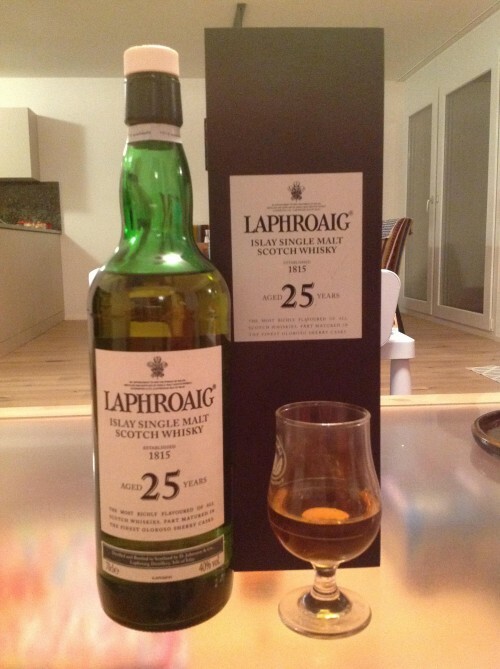 I reviewed the 2013 release 25 yo Laphroaig Cask Strength. Cask Strength in that case was 45.1% ABV. In the case of the 2013 CS release 45% ABV seemed completely adequate. But no, I would not have wanted it watered down to 40%. @Victor - good point and I thought that may have something to do with it but at least bottle it at CS even if that's 41%. @RianC, oh, for some of us ABV envy, or really more accurately desire, is definitely a thing. Show me a whisk(e)y bottled at 80% ABV and I want it! Yes, there are such monsters, though I've never tasted or seen one in person. Jim Murray reviewed a German-owned private cask bourbon which was bottled at 82.7% ABV. If he got to taste it, I want to too! The most I have in stock is 73.75% ABV. While that is a very righteous ABV, an ABV higher than the ABV of the highest ABV George T. Stagg, the human spirit always wants more.